Do people hate new technology... or just how it’s used? After a short hiatus (and a ridiculously busy schedule which sadly hasn’t involved riding anywhere interesting) I’m back, and my first post isn’t even about bikes... it’s about the beginnings of a backlash I’ve been noticing lately. Back in February, a young technology writer and self-styled social media consultant got herself in a spot of trouble with patrons of an ‘alternative’ (I really dislike that term) bar—Molotov’s—in San Francisco when she continued to use her Google Glass (variant thereof pictured right) to film them after they’d expressed increasingly hostile discontent (you can see some video clips, as well as her account of the incident here). Of course the media jumped on this, with some articles branding the incident a hate crime. I have a serious issue with this—the definition of a hate crime is a (usually) violent act motivated by race, ethnicity, disability, religion, sexual orientation etc. I find it offensive that the term ‘hate crime’ would be used to describe the reaction to socially inept, self-entitled (and indeed selfish) behaviour on the part of both parties. But what are the ‘haters’ hating? The technology? Or the people using it? I know, from my own point of view as someone who readily embraces new technology, if I’m out enjoying an evening with my mates at my local, the phone stays in my pocket unless there is a bloody good reason to take it out. Perhaps a few snaps will be taken of our group to remember the night... But I’m out to spend time socialising—connecting with my fellow human beings. But that’s just me. Nothing screams social pariah more than someone at the next table holding their smartphone at eye level, creepily filming your every move. 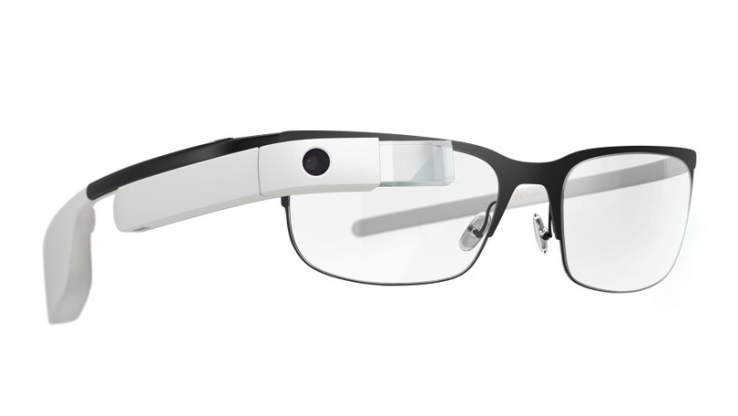 Worse yet, someone wearing Google Glass, leering obsessively in your direction. On a night out, no one expects a considerable amount of privacy in crowded venues or walking along the pavement—but at the same time no one expects to have their every move filmed by a random third party and potentially posted publicly for scrutiny on a worldwide scale (exhibitionists excluded, perhaps). It may be legal, but it’s certainly not ethical in this context, and doing so brings into question a person’s moral standards. I sympathise on some level with the developers, as the concept is intriguing—using a heads-up display means our westernised world of smartphone-addicted zombies can stop fixating on a small screen while walking into others or straying into the path of a double-decker bus [insert Darwinian reference here]. It’s the people using the technology who need to get their heads out from behind the ‘mask’ of their computers and smartphones to re-learn the art of reading their environment and social interactions of the human beings around them. At a technology expo it is likely entirely appropriate for someone to covertly film other show-goers while playing with devices like Google Glass—at a bar (or in many social settings) it most certainly is not. People are fed up with CCTV cameras spying on them at every corner, having their dirty laundry aired (literally) at airport security checkpoints, and (depending on their level of paranoid delusion) the government potentially intercepting their online activity... these types of surveillance are not within our control. But when a private citizen potentially imposes surveillance on us without consent, it is within our control to object—and many of us feel compelled to do so. So it is no surprise that our social media consultant friend above had an altercation when her own video footage shows people masking their faces and others approach her on more than one occasion in a somewhat terse, but not overly threatening way referencing her Google Glass. The Daily Mail (or as we British lovingly refer to as the Daily Fail) is a sleazy rag of over-sensationalised tripe and was rather generous in the article with the phrase ‘ripped the Google Glass off her face’—the video ends with a chap walking up and removing the glasses to stop the filming after the his party’s repeated and increasingly belligerent requests were ignored. Like most people, they no doubt didn’t want video clips of their night out ending up in the public domain which, ironically after all the media coverage, is exactly what happened. Another article notes that one of the objectors, who was an off-duty employee at the bar, ended up getting the sack in the days following media coverage of the video footage. The article implies (but, to be fair, does not confirm) that this was connected to the incident. Alcohol consumption undoubtably fuelled the fire, but if it was me, I would have taken off the Google Glass long before events escalated—this would have avoided a ruined evening, a scuffle, a theft and the loss of someone’s job. Her blog entry explains the incident from her point of view and she is clearly an intelligent, well-written individual (who understands the disappearing art of good grammar)—so how can a smart person miss so many signs and opportunities to prevent events from spiralling out of control? Venues are within their right to pose restrictions as they see fit. After ripples of negative press about the Molotov’s incident, I can’t say I blame the bars and pubs in the Bay Area which have chosen to ban Google Glass. They don’t want to be featured as ‘the next Google Glass fiasco’. This shouldn’t really be a surprise to anyone. With Google Glass, I’m not convinced people hate the technology—I believe they hate the way people use it, or, more accurately, the way they perceive that people will use it. There is a saying—respect you, respect me. If you’re on a train and people around you are getting annoyed at the ‘tsh tsh tsh tsh tsh’ emanating from your headphones, get over yourself and turn the volume down a bit. If you accidentally cut off someone in traffic because your car’s blind spot detection system didn’t do its job, swallow your pride and wave an apology to the other person. If people around you don’t consent for you to film them, stop being an antisocial [insert expletive of choice here] and put away the smartphone, Google Glass etc. There is some great technology out there—use it respectfully, wisely. There’s enough anger in the world without provoking it further. My parting shot is this video which has gone viral with more than 45 million views in just three months. Remember the backlash I mentioned at the beginning of the article? It has already started. What are your thoughts about socially unacceptable use of technology? Let me know in the comments below.